Shell size to 18 mm. Shell with a sculpture of alternating primary and secondary ribs and concentric cords. Shell edge scalloped, shell oval, and orifice (“keyhole”) also oval and reinforced internally by a callus. This later is in turn delimited by a reddish-pink line. Shell colors and patterns vary, but mostly consist of reddish-brown radial bands of distinctive widths set on a lighter-colored background. The internal shell surface is greenish. 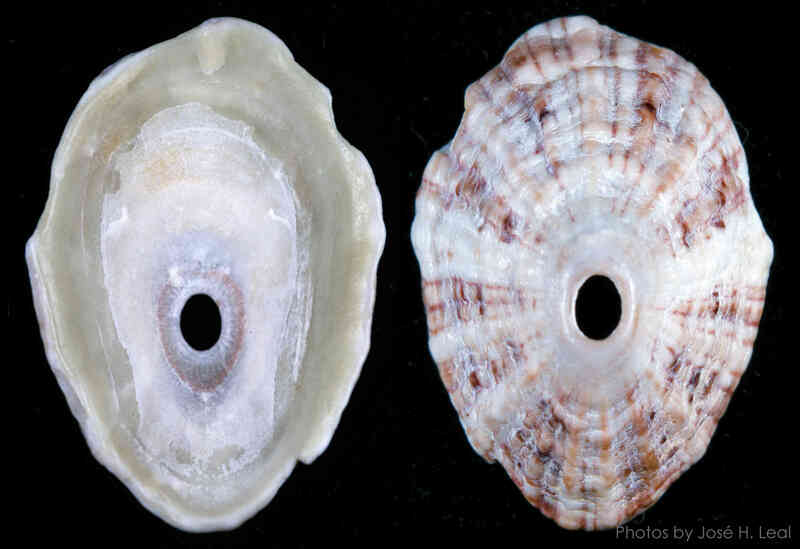 The limpet illustrated was found by Austin Salender on Sanibel. The only other record of the species from our area in the Museum collection consists of two shells collected in 1957 by William Brumbach on Sanibel!